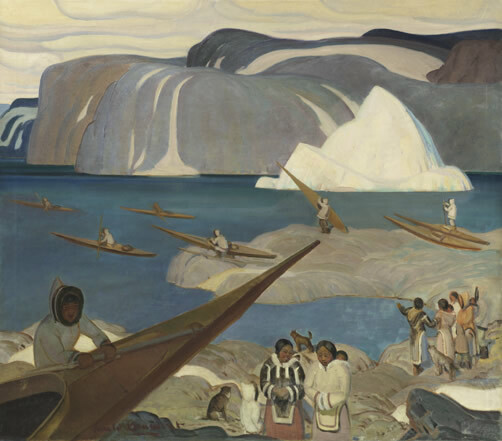 A Canadian Interpretation – Examining the culture and heritage of Aboriginal Peoples in Canada through art. During the South Granville ArtWalk Uno Langmann Limited will be honoring the culture and heritage of Aboriginal Peoples in Canada, and we welcome you to stop by and observe their history through works of art. This exhibition will feature works by Canadian Indigenous and Non-Indigenous artists including Charlie James, John Innes, Thomas Harold Beament, Norman Tait and numerous works by unnamed Salish, Haida, Musqueam and Nuu-chah-nulth artists. First Nations heritage is shaped by the objects, artifacts, and art that Aboriginal people encounter daily. This heritage is represented in this exhibition through paintings, carvings and objects that depict traditional settlements, practices, and traditions of First Nations, Metis and Inuit of Canada. Lecture on Canadian Indigenous peoples traditions as they are depicted in artistic practices of both Indigenous and non-indigenous artists within the Uno Langmann Limited collection.